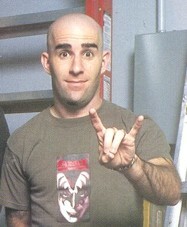 Inspired by the NWBHM movement, guitarist Scott Ian founded Anthrax in New York in 1981. From its inception he has been the band's principal lyricist, and remains its sole original member. Anthrax was one of the earliest purveyors of thrash metal, exploring a faster and more extreme approach alongside other influential bands such as Metallica and Slayer. In 1997, while on a drunken binge, Ian attempted to break into the training facility for the New York Yankees and was subsequently arrested. It is no doubt a source of great irritation to the guitarist that this fact keeps turning up in all of his profiles.